Kadri Gopalnath (b. 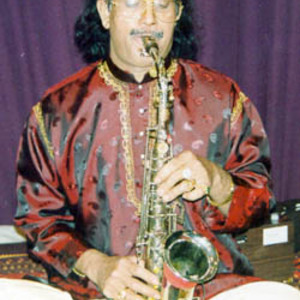 1950) is an Indian saxophonist and one of the pioneers of Carnatic music on the saxophone. Kadri Gopalnath was born in Dakshina Kannada district, Karnataka. He acquired a taste for music from his father Thaniappa, a nadhaswaram vidwan. Young Gopalnath once saw the saxophone being played in the Mysore palace band set. Thrilled on hearing the vibrant tone of the saxophone, Gopalnath decided to master it. It took him nearly 20 years for him to conquer the complex western wind instrument and he was eventually crowned as the "Saxophone Chakravarthy". Kadri Gopalnath was born in Dakshina Kannada district, Karnataka. He acquired a taste for music from his father Thaniappa, a nadhaswaram vidwan. Young Gopalnath once saw the saxophone being played in the Mysore palace band set. Thrilled on hearing the vibrant tone of the saxophone, Gopalnath decided to master it. It took him nearly 20 years for him to conquer the complex western wind instrument and he was eventually crowned as the "Saxophone Chakravarthy". Gopalnath had to make certain modifications to the conventional alto saxophone to play Carnatic music. So successful has this adaptation been that the great musician Semmangudi Srinivasa Iyer, the doyen of Carnatic music, has acknowledged Kadri Gopalnath as a true Carnatic music genius. Gopalnath learnt the instrument under Gopalkrishna Iyer of Kalaniketana, Mangalore. In Madras, Gopalnath came in contact with the mridangist T.V. Gopalkrishnan who identified the youngster's potential and tutored him. His maiden performance was for the Chembai Memorial Trust. 1980 Bombay jazz festival was a turning point for Gopalnath. John Handy, a jazz musician from California was present at the festival. Hearing Gopalnath play, Handy asked if he could go on stage and perform alongside with him. So well did the two mesh, Handy in the jazz style and Gopalnath in the Carnatic style, that it became an instant hit with the audience. Gopalnath has participated in the Jazz Festival in Prague, Berlin Jazz Festival, International Cervantino Festival in Mexico, Music Hall Festival in Paris, the BBC Promenade concert in 1994 at London and has toured all over the world. He has cut many albums and has recorded a number of cassettes and CDs. Together with jazz flutist James Newton he recorded Southern Brothers. His production called 'East-West' is an audio-video presentation that, as the title suggests, is a fusion of Western and Indian music. This album took 6 months to produce and has compositions from Saint Tyagaraja, Beethoven and the likes. Film director K. Balachandar used Gopalnath's services in his Tamil film Duet. Titles and honors have come his way, the most cherished being the Asthana Vidwan of Sri Kanchi Kamakoti Peetam and the Shringerei Sharada Peetam. He was awarded the Padma Shri in 2004.